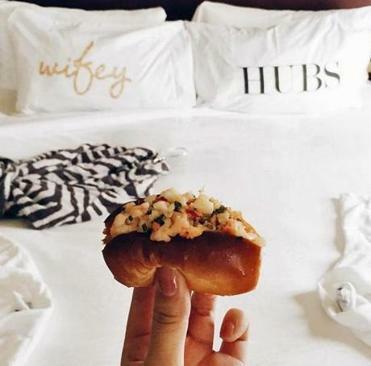 Custom pillow cases and a lobster slider at Hotel Marlowe. Walking into her hotel room after dinner, Diane noticed candlelight coming from the bathroom, and the heady scent of roses. Sure enough, the Jacuzzi tub was filled with a towering mound of bubbles, bedecked with rose petals, and lined with flickering votive candles. Smooth jazz was playing on the sound system. Too bad she was traveling solo. This lavish set up is an example of how hotels are saying “sweet dreams” to their guests, and maybe hoping to stir up some buzz and good will. (It worked — Diane posted that tub shot on social media. And totally enjoyed the bubble bath.) A chocolate on your pillow is so yesterday. These days, some hotels and inns are pouring on the charm (and the bath oil) at bedtime, offering special treats to make your stay more memorable. It’s part of the “overall customization of the experience, where independent hotels get to know their guests and try to personalize the experience as much as possible,” says Kenan Simmons of Small Luxury Hotels of the World, representing more than 520 properties. Customizing the turndown treat is part of this trend, he adds, citing cookies personalized with the names of young guests and local seasonal savories for foodie types as some examples. Curiosity piqued, we sleuthed out a sampling of fun turndown treats. Here are some of our favorites. At the bucolic Lodge at Glendorn, in Bradford, Pa., it’s in your best interest to share your best interests. If you love fly fishing, you might be gifted with a tackle box with homemade flies; if you’re a foodie, you might come in after a day of outdoor fun and discover a freshly baked loaf of bread and a jar of honey from the lodge’s own bees, or a bottle of house-made maple syrup. www.glendorn.com. Things get cute at The Bowery Hotel in New York City, where oh-so-cuddly Bo the Bowery Bear sits on the red-and-white duvet cover in every guest room. Snuggle all you like; Bo gets dry-cleaned frequently! If you get really attached to your fuzzy companion, bears are available for sale in your mini-bar. www.theboweryhotel.com. And who doesn’t like pie? Nobody. That’s why everyone’s keen on the “pie on a pillow” offered by the Caldwell House Bed & Breakfast in Salisbury Mills, N.Y., located near the wineries on the Shawangunk Hudson Valley Wine Trail. These delectable mini-pies, offered as an autumn treat, are house-baked with seasonal, locally sourced fruits. Visit during holidays, and you’ll find a themed goodie on your pillow, like shamrock-shaped cookies on St. Patrick’s Day. www.caldwellhouse.com. They kick it up a notch at the Craftsman-style Kimpton RiverPlace Hotel in Portland, Ore. This hipster haven has an actual Bedtime Butler, who is known to show up with cocoa, cookies, a bedtime storybook, a kid-friendly DVD, mini-bathrobes, and other nighttime niceties for small fry. For grownup guests, treats might include a boozy nightcap, comfy slippers, or calming sprays and oils. The twist here is, you can’t order this, or request it; the Bedtime Butler shows up randomly. “It’s fun for the guest to get that surprise knock on their door, and our Butlers have a lot of fun doing it,” says Ryan Kunzer, general manager of RiverPlace. www.riverplacehotel.com. Heading to Miami for some revelry — maybe a bachelorette party or milestone birthday with your best buds? At the Ritz-Carlton, South Beach, they get that. On select occasions, the property will treat you to an appropriately adult amenity: a fedora containing the makings of a Cuba Libre, including fresh limes, rum, Coke, a muddler, and a recipe card for the hotel’s version of this cocktail. www.ritzcarlton.com. Couples who wed at the Hotel Marlowe in Cambridge get a visit from the wedding fairy at turndown time. When the twosome return to their honeymoon suite after the festivities, they find custom pillowcases that read “Wifey” and “Hubs” — or “Wifey” and “Wifey” and “Hubs” and “Hubs” — which are theirs to keep. And since the fairy realizes that many couples don’t eat much during their wedding reception, there’s also a surprise snack waiting: lobster sliders from onsite Bambara’s Kitchen & Bar. www.hotelmarlowe.com. A miniature Stave puzzle at Twin Farms inn. There are many reasons to visit the luscious, five-star Twin Farms in Barnard, Vt. — the gorgeous setting, the scrumptious food, the museum-worthy American art. One quirky element: at turndown time, they place a miniature Stave puzzle on your pillow. 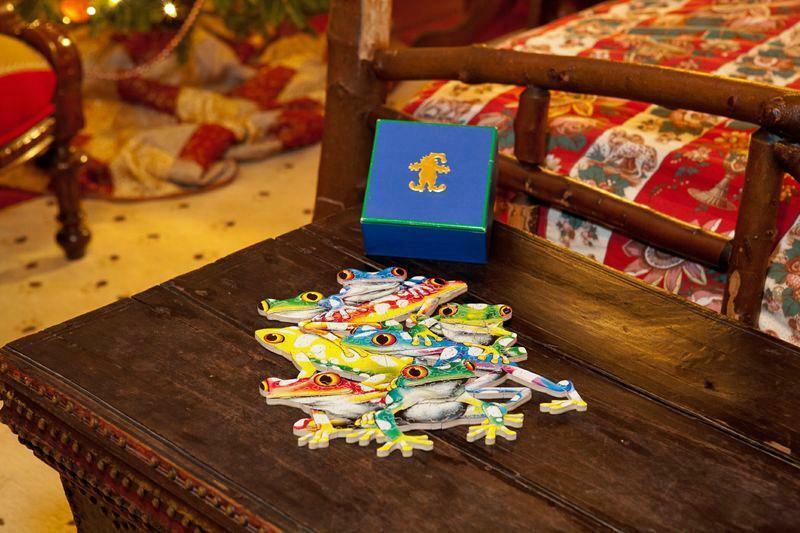 A larger version of these locally crafted, devilishly hard wooden puzzles might keep you up at night, but this tiny one is, as Goldilocks would say, just right. www.twinfarms.com. Set in a Victorian castle on Lake Mohonk in New York’s Hudson Valley, the Mohonk Mountain House in New Paltz is a perennial on “best resorts” lists, thanks to its rustic beauty, crazy-long list of outdoor activities, and eco-friendly spa. One of the small things that make a stay here special: at turndown time, you’ll find an original poem on your pillow, by Frieda Feldman, Poet Laureate of Key Largo, Fla., and a frequent guest at the property. Pillow poems are meant as a “small gift of mindfulness at the end of the day,” we’re told. www.mohonk.com. Here’s one with a retro twist: In the interest of keeping their guests comfy, the six family-run Red Carnation boutique hotels in London will slip a cashmere-covered hot water bottle between the sheets on guest beds when the weather is chilly. You might also encounter a lit, floating candle in your bathtub, enticing you to shed your clothes and forgive London for its weather. www.redcarnationhotels.com. Dreaming of a trip to the Andes? If you choose to stay at the colorful 16-room Entre Cielos in Mendoza, Argentina, your dream trip will include a “dream card” on your pillow. Before you settle in for slumber, write down your fondest wish on the card, and hotel staff will hang it outside on the dream arch. The greater the number of people who pass under the arch, the more likely your dreams or wishes will come true, they say. For oenophiles, this might be redundant, since the property features a working vineyard in one of the largest wine regions in Latin America, plus a hamam spa with vinotherapy treatments. www.entrecielos.com.